Thanksgiving celebrations are behind us. The holiday season is in the air. The excitement of year-end shopping, family visits, everyone getting ready for the so awaited Hanukkah Celebrations, Christmas Eve, and of course Christmas. The snow gradually begins to cover the area like a white sheet, everything is harmony and hope. “Silent night, holy night. All is calm, all is bright”. However, all that can change, literally, in just a bang! According to recent statistics about one million Americans are injured because of slip and fall injuries and/or pedestrian accidents on a yearly basis. There were around 42,000 workplace injuries or illnesses from ice, sleet, or snow that required at least one day off from work as a result. The risk of slip and fall injuries increases significantly during winter months. Many of these injuries are due to negligence of property owners to adequately clear a safe path in parking lots and sidewalks. 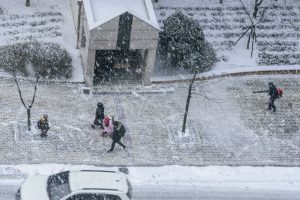 According to a Philadelphia city ordinance, homeowners and business building owners should clear a 36-inch wide path on sidewalks, within six hours. The omission of this instruction increases the chances of suffering an injury. These injuries due to dangerous walkways and roadways can result in anything from foot and ankle injuries to much more traumatic injuries to the spinal chord, bone fractures, brain injuries, and can even result in paralysis. At Kamensky, Cohen & Riechelson, we are prepared to guide you in your legal journey as a result of personal injuries suffered during the winter season, contact us for a free and confidential consultation. Call us today (215) 337-4915. Foot and ankle injuries are common in winter and can cause major injuries as well as financial problems in medical attention. Wounds range from what appears to be an innocent blow or ankle sprain, to breaks and more serious injuries that require surgery for their attention. If you experience a fall that you consider mild, one of those in which your companions and even you laugh while getting up from the floor, shaking off snow from your clothes, you must pay close attention to what your body tells you. A slight wound, imperceptible to your sight, can turn in the course of days to a nightmare of pain and high price consequences for your health and your pocket! So do not delay in visiting a doctor who will help you treat your ailment. Only an MRI will really reveal the magnitude of your injury. For those minor injuries, while rest is always recommended, many end up needing to wear a walking boot to take pressure off your foot. In even more serious circumstances, individuals end up with back, neck or even head related trauma that doesn’t immediately present itself at the time of the fall. Even if you “feel ok” after the accident, it is imperative that you seek medical attention as soon as possible after the incident takes places. Whether in a slippery parking lot, an unbalanced sidewalk, or due to unpaved property during a storm it is important that you protect your rights and/or the rights of your loved ones. Don’t let a delayed injury cost you a small fortune in medical bills and rehabilitative care. Damage to muscles and tendons are also recurrent in winter time. A strain or an ankle sprain can also be very painful, and sometimes both scenarios can occur due to the same incident, which makes it more difficult to differentiate one from another. Depending on the severity, treatment can range from resting, applying ice, anti-inflammatory medication to expensive surgeries. These injuries and ailments in addition to being a physical problem can become a financial annoyance to have to cover costs associated such as medicines, therapies, surgeries and so on. Even having medical insurance sometimes is not enough for those extra (and unexpected) expenses. In addition, the absence of days from your work due to your fall can affect your budget. Use appropriate shoes. Slippery soles will make it harder for you to walk through dangerous areas full of ice. Put on shoes with non-slip soles. Look where you walk. Walk on the sidewalk whenever possible. If a surface looks slippery, tap with the tip of your shoe before going over it. Be especially careful with dark floors, as it is more difficult to detect ice on these floors. Walk at a slow pace, with balance, running or jumping makes it much easier to lose control of your steps. If you have to walk on the ice, bend your knees a bit and take short steps. Keep your balance. Keep your hands free to help your balance. If there are handrails, use them. Try to avoid carrying heavy packages on slippery surfaces, and do not load packages that prevent you from seeing where you are walking. Do not let your clothes prevent you from seeing clearly. You need to stay warm, but do not wear a scarf, hat or hood that limits your vision. Unfortunately, even following the above recommendations, these incidents may occur. As we all know the saying goes, “Things Happen!”. Some slip and fall incidents cannot be avoided and are out of our control. Our attorneys have decades of experience litigating injury and accident cases across Bensalem and the Northeast Philadelphia region. If you believe that your situation might be due to external factors that could be previously observed, call us or fill out a contact form and with pleasure the attorneys of Kamensky Cohen & Riechelson will be willing to discuss your particular case and assist you. If required we can come to you, or you can come in to one of our convenient office locations in Philadelphia or Bensalem (215) 337-4915.